There was no sound around me except the soft purr of sled runners on fresh powder and the synchronized panting of six dogs, tongues lolling, straining against the harness. Dark spruce trees, like sentries, framed the trail along the edge of the frozen stream. My feet were planted firmly on the runners, and I leaned into each curve, snow spraying in a wake behind me. A marten watched from a pine branch as our procession of sleds passed underneath him, and moose tracks crossed the deep snow into the dark undergrowth beyond. The exhilarating majesty of winter in Ontario was around every corner here, far from the grey slush of city streets. I was in Algonquin Park on a weeklong dog sledding expedition with Chocpaw, the largest sledding outfit in Canada, in the business for over 40 years. Their expeditions are staffed by 400 Alaskan sled dogs, a crockpot, mongrel crossbreed first developed by racing kennels in Alaska. 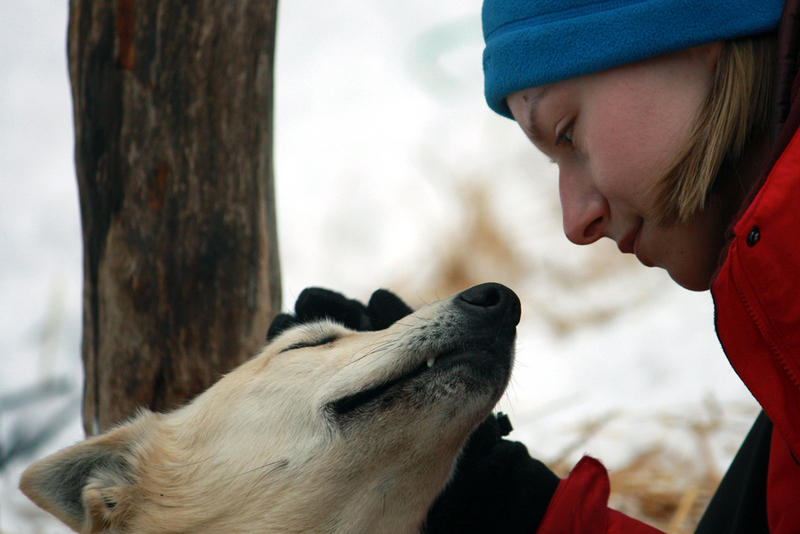 There are many different breeds used for sledding, each with its own benefits and tradeoffs. 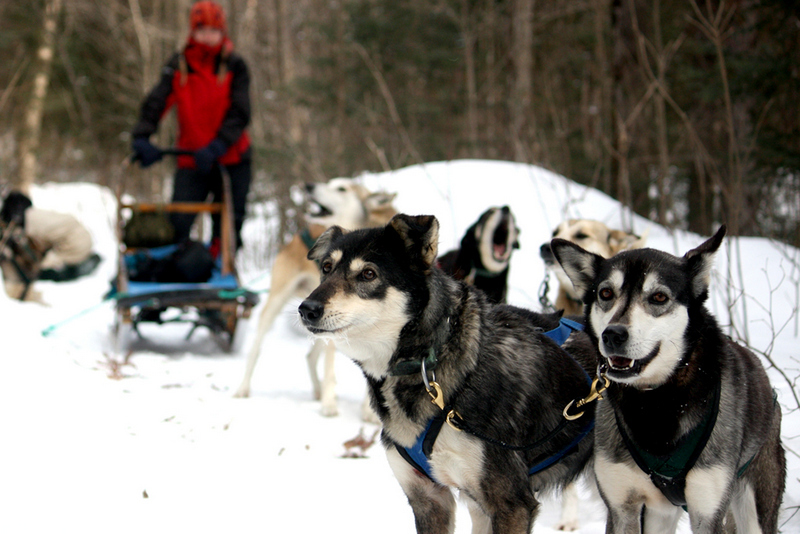 The Alaskan is nimble and fast, a favourite for dog sled races. The Malamute has no speed to speak of, but, like a small furry tank, can bear heavy loads over very long distances. Meanwhile the “classic” concept of the sled dog, the Siberian Husky, is a powerful engine that can pull more, pound for pound, than the Malamute, not for nearly as long. Whatever the type, the sled dog is bred not for appearance, but for efficiency, intelligence, endurance, and love of running. These dogs don’t just like to run, they live to run. Put into formation at the head of the sled, they dissolve into a delirious frenzy of anticipation, howling happily. In fact, we were warned by the guide that if we fell off the sled, the dogs wouldn’t stop – they would keep running until the next campsite, which could be over 20 kilometres away. That being said, I have never encountered more friendly, obedient, eager-to-please dogs, who see the human as their partner in an adventure. And what an adventure it is. At the launching point by the forest edge, the expedition send-off is controlled pandemonium, as harnesses are untangled and laid out, final instructions from the guides meted out, and sleds are packed up and tied down – sleeping bags, packs, and food for humans and dogs for several days in the bush. 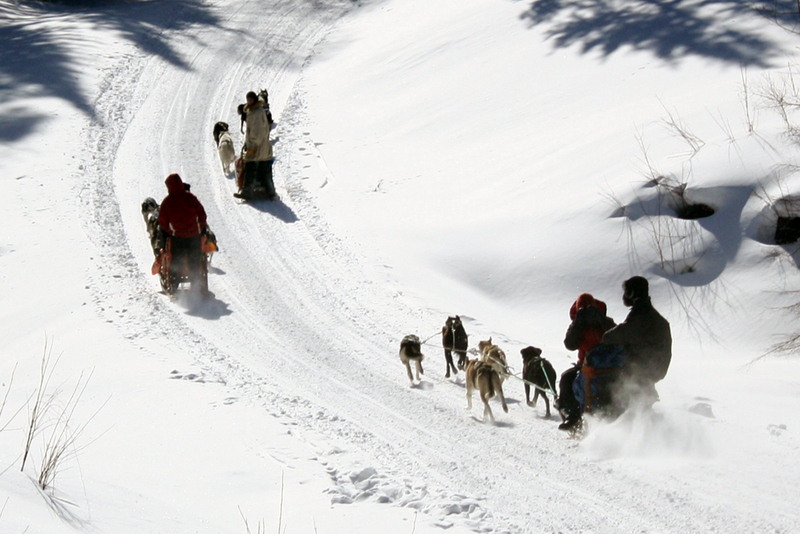 The math is 2 people + 1 sled + 6 dogs. 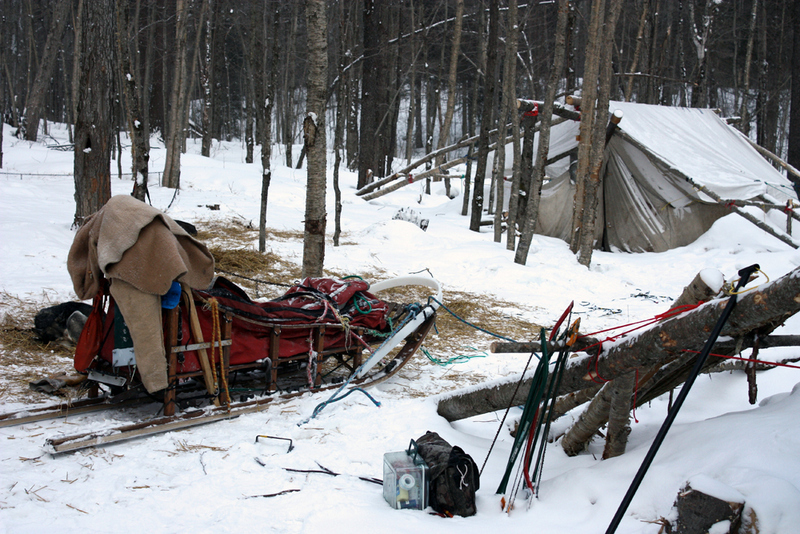 One partner sits in the sled with the supplies, while the other stands on the back runners, driving the team. Trip difficulty is adjusted based on the experience of the participants. While day-tripping school groups may be going for easy lopes along flat paths, we were challenged by the plethora of winding trails laid out throughout Algonquin. 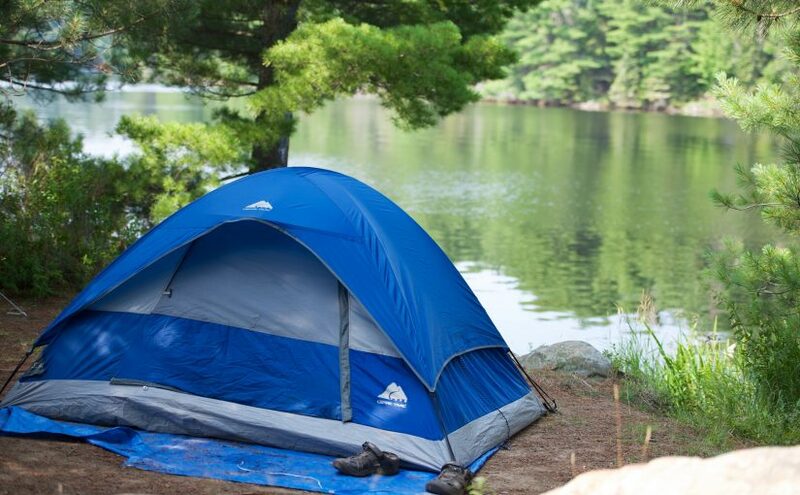 Accommodations are relatively luxurious, considering they are in the middle of a winter forest. Several pre-set camps are spread out through the bottom edge of the park, with large military-style tents built on wooden slatting, complete with squat-legged wood-burning stoves and wide shelves that serve as communal bunks. Chocpaw provides all-weather sleeping bags for an extra fee, and proper winter boots for those who are used to city footwear. Bathroom facilities are minimal – a plywood outhouse twenty metres from the tent, its seat often dusted with fresh snow. No showers, of course – water is hauled from chopped holes in a frozen lake, and firewood is cut down from surrounding trees. In the forest, existence was simplified to primeval basics – water, food, sleep, sledding. We broke fresh trails and careened down steep slopes; ran up hills pushing the sled ahead of us, and loped gently along winding flat passes. In the cold air, after a thirty-kilometer trail, we were exuberant and ravenous, every bite delicious, every sip of water unparalleled. In the evenings, we sat around the campfire, nursing mugs of hot chocolate, trading stories, and watching the flames flicker in the eyes of the dogs laying around us. The tent was a jungle of socks, boot liners, gloves and jackets drying in the rafters, soaking in the smoke from our steak dinner cooking on a gas stove at the tent entrance. We woke up with the winter sun and collapsed into our sleeping bags early, sleeping dreamless and deep, like children. It is the adventure of a lifetime, a harkening back to the days of early Arctic explorers breaking new ground with the sled teams, or the feverish ambition of the Alaskan gold rush. In the silence of the forest, we were each a pioneer, discovering the world anew. 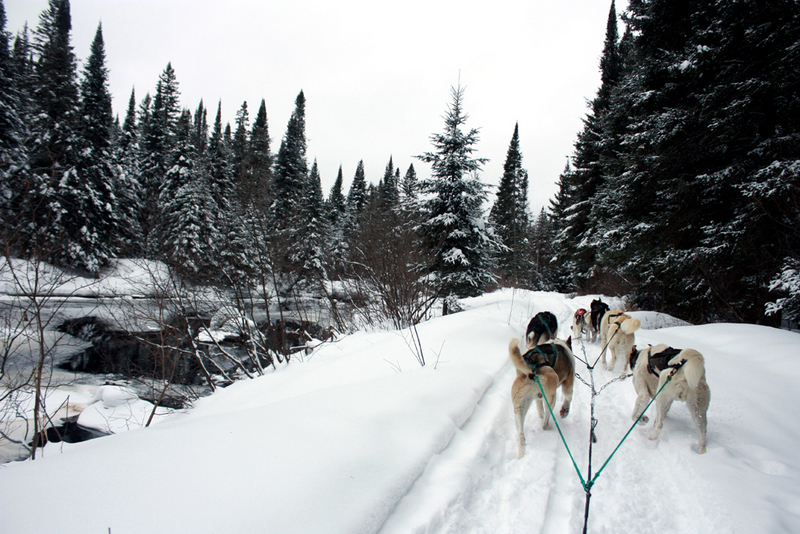 Chocpaw runs trips from the first snowfall of the season until the snow melts in spring. Trip lengths range from a day run to a week-long expedition, with varying options in between. While driving is the best way to get to Algonquin, Ontario Northland also runs a year-long shuttle bus service to South River. Round-trip from Toronto is about $120 and 5 hours each way. Dog sledding trips start early in the morning, so to avoid driving in the wee hours of the night, arrive the night before and stay in the Algonquin Motel. It is a destination in itself, with each clean, well-appointed room whimsically painted with murals of anthropomorphic bears or butterflies spewing rainbows. Then start the next day off with breakfast at Sherri’s Diner before heading to Chocpaw.